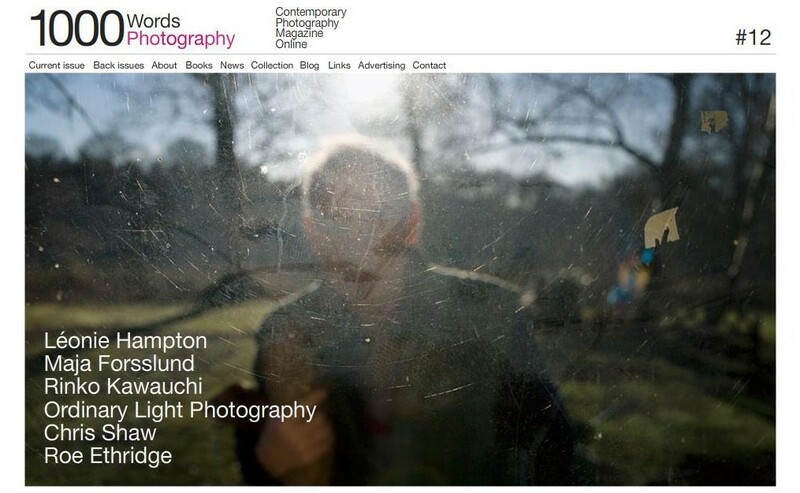 Featuring portfolios from Léonie Hampton, Chris Shaw, Maja Forsslund, Rinko Kawauchi, Ordinary Light Photography and Roe Ethridge alongside in-depth interviews, essays and reviews by Louise Clements, Simon Baker, Lucy Davies, Natasha Christia, Brad Feuerhelm and Margaret Gray, 1000 Words attempts to show a kind of photography that draws directly and honestly from life; work that does not fit neatly into categories yet which can be infinitely more rigorous and fresher than any attempts at visual gimmickry made by the latest tricks of the trade. In line with this, we also cover new titles from Andy Sewell, C Photo and Enrique Metinides in the dedicated books section courtesy of texts from Michael Grieve, Oliver Whitehead and Daniel Campbell Blight. "[...]'Thereness' is a sense of the subject's reality, a heightened sense of its physicality, etched sharply into the image. It is a sense that we are looking at the world directly, without mediation. Or rather, that something other than a mere photographer is mediating. [...] Such a feeling, such alertness, when present in the photograph, can of course conceal the greatest photographic art. 'Thereness' is seen at the opposite ends of the photographic spectra, in the humblest holiday enprint as much as the most serious art photograph, in the snapshot-inspired, dynamic small camera candid as much as the calm, meditative, large camera view. Those photographs which conjure up a compelling desire to touch the subject, to walk into the picture, to know the photographed person, display 'thereness'. Those photographs which tend towards impressionism, expressionism or abstraction can be in danger of losing it, or never finding it [...]. 'Thereness', in short, is a quality that has everything to do with reality and little to do with art, yet is, I would reiterate, the essence of the art of photography". Thanks to all the photographers, writers and editorial and production team as well as of course our advertisers for contributing to yet another fantastic issue of 1000 Words.